This is a tentative reconstruction of Paluxysaurus jonesi. All the material in this reconstruction comes from Jones Ranch in Texas. A recent paper (D'Emic 2012) has referred it to Sauroposeidon proteles, which is the reason I decided to try and do a skeletal reconstruction. I'm a bit skeptical as to whether Paluxysaurus jonesi should be referred to Sauroposeidon proteles just yet. That said, I don't doubt the two could be closely related and Paluxysaurus could, therefore, be a good starting point when restoring Sauroposeidon. 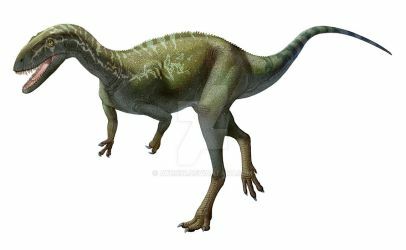 Paluxysaurus is known from multiple fragmentary individuals, which means that there is a lot of uncertainty in this reconstruction. That said, it should hopefully give some idea what Paluxysaurus might have looked like. The skull is only known from the nasal and maxilla. I have restored the nasal in a similar orientation to the mounted specimen, and as described by Winkler et. al. 2013 which if correct suggests that the high arching nasal (like those seen in Brachiosaurus or Giraffatitan) that is usually restored for Sauroposeidon isn't correct. However, the paper describing Paluxysaurus (Rose 2007) suggests a more brachiosaur like configuration. Without better images of the material, I can't be certain of the nasals exact shape and orientation, how long the snout is or where the tooth positions are. More vertebrae are known, they just aren’t illustrated in the description due to them still being prepared. Most of the vertebrae that are illustrated are either incomplete or distorted and I've had to try and restore them. I have assumed 13 cervicals and 12 dorsals. Cervical 9 is illustrated in the description but is only shown in top view so I have had to guess what it looks like in lateral view, I used top view illustrations from Giraffatitian to estimate the overall proportions of the complete cervical. What's described as the first dorsal is quite small and probably comes from a smaller individual. I scaled it up to match the articulated third and fourth dorsals. The posterior dorsal vertebra has quite a short centrum. If it does belong to Paluxysaurus then it suggests that the dorsal vertebrae get shorter towards the sacrum like they do in brachiosaurs. Based on just how short the centrum is, I have assumed that it is the last dorsal. The two rib fragments were only illustrated in front view and I'm not certain exactly where they go. I used Scott Hartman's Brachiosaur tail as a reference to help estimate the positions of the illustrated caudal vertebrae within the tail. I have assumed 50 tail vertebra. With the exception of two vertebrae, I have assumed that all the illustrated caudals come from a similarly sized individual. These two caudals have a skewed appearance which I'm not sure is distortion or actual morphology; they have been ignored in this diagram. I have assumed that the limb material is from a similarly sized individual as the articulated 3rd and 4th dorsals. The radius and ulna are probably distorted or have a pathological condition, it's unclear how straight they would have been in life. I probably should attempt to correct for this but I have left them close to their shape in the fossils; these bones corrected would probably raise the shoulders a small bit. 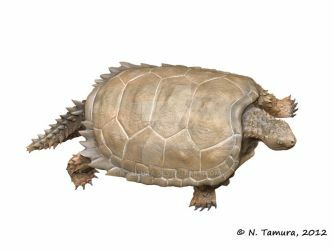 A few humeri are known, but only one was illustrated in side view and it is incomplete; because of this, it's unclear what the more complete humeri would look like in side view, so I have light greyed them out. Three metacarpals are illustrated in the description, only one (that might represent number IV) was found near the other limb elements. I couldn't figure out how to get the known metacarpals to fit together so I just illustrated a fairly generic sauropod manus around metacarpal IV. 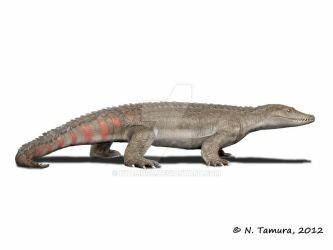 I have illustrated a more basal manus like those of brachiosaurs and camarasaurs, which still have obvious finger bones. It could be that Paluxysaurus had the more derived condition in which the metacarpals are touching the ground and the finger bones are tiny stubs. D'Emic redescribes the Cloverly sauropod material and refers it to Sauroposeidon. I haven't included Cloverly material yet, I do suspect the Cloverly material and the 'Paluxysaurus' material represent similar animals. I still not sure that they should be lumped into the same species yet, I prefer it when specimens are treated separately because it helps reduce the chance of variation being ignored. Update 11/07/2013: Illustrated the hypothetical missing bones. Update 02/10/2013: Added in the pelvic material described by Winkler et al. 2013. Currently, I'm not quite certain on the transition between the sacral vertebra and the caudal vertebra. Update 20/08/2018: I've finally added in the two caudals that I ignored the first time around. I noticed looking at other sauropod tails that the transition from the anterior taller thinner spined vertebra to shorter broader spined vertebra seems to happen sooner than I had originally illustrated, so I bunched up the vertebra a bit more; this has shortened the tail a little bit compared to the last version. The nasal bone has been described in two different orientations; as more brachiosaur-like in Rose 2007, and a flatter orientation in Winkler et. al. 2013, because of this I have decided to show two skull interpretations. I have also done other nips and tucks here and there, such as straightening the dorsal column. I used Ville Sinkkonen's dinomaniac.deviantart.com/ , GSP's skeletal and photos of the fossils as references. The skull of Beipiaosaurus isn't in the best condition so I went for a hybrid of Ville Sinkkonen's and GSP interpretation. GSP restores the tip of the snout as flat in side view whereas Ville Sinkkonen has given it more of a 'beak-like' appearance. I've gone for somewhere in the middle. Update 10/05/18: I have updated this image somewhat, with the focus mainly on the background. What I've been doing is, experimenting with using CG to help create environments for some my dinosaur images. The aim for this image was to try and make the pencil drawn elements not jar with the CG elements. Within the image is a combination of generated Photoshop trees in and Creative Commons trees and plants from Blendswap, which were then modified. Credit for those plants; Sabastian Lague, Oliver MH, The Mav, Betomo16, Joseph Bennett. In the future, those models could be adjusted to better match prehistoric species. I have also given Beipiaosaurus an actual keritenous beak. According to the literitutre the premaxilla hasn't been described which is probably the reason for various reconstructions differing in that area. What do you, fellow humans, think the best way to update an image on DeviantArt is? The reason I ask is because I often update my images a fair bit; to either improve scientific accuracy or artistic rendering. Some of my images are on Wikipedia so I feel it's important to keep those inline with current thinking. Sometimes an update will be a minor artistic touch-up/correction that I don't mind updating over the original. Often, however, I find I'll do an update that is so drastically different from the original image that I feel the original should be preserved for those who 'favourited it' in an older state. They might prefer the older version. 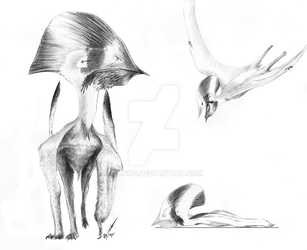 I know there are people out there who prefer to see an image that is clearly a traditional pencil drawing for example. My updates are all digital and often they move away from that pencil drawn look. 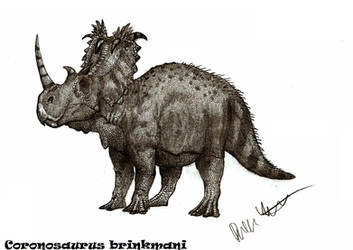 Take a look at these two versions of my Tsintosaurus image. They are basically the same image, they share the same DNA but are drastically different in rendering and anatomy. It's not like it jumped from the 2007 version straight into the 2017 version, it evolved into this over a decade of Smaller Edits. What I don't want is hundred of similar but different deviations cluttering up my DA account. One way I have done this is re-uploaded over the original and created a new deviation in 'scraps' for an older version and linked them to each other. The downside is I feel you are forcing a new version on someone who might not appreciate it in its new state. The other option is just to created a new deviation and called it '.....Version 2/3/4' etc. The downside is you might end up with loads of different versions that clutter your gallery and are all basically the same image; this offends my OCD. I've done this in the past if the change is drastic like going from a greyscale pencil look to adding colour and going to a digital look. If you update an image on the Wikimedia Commons, it shows you a file history so you can see the progression of an image. This type of system is great because you can have the one version that people can go to and still see all the different versions you have created in the past. What do you people think is the best way of doing this on DA? Hi Steveoc86, I'm intending to draw some Alamosaurus based on your diagram for Wikipedia? May I use it as a reference? Will give you credit, of course. Sure, feel free! Although that diagram is somewhat of an amalgamation of a few reconstructions. It started off based on a published one but over the years I modified it to better emulate newer reconstructions. I'd recommend dropping Scott Hartman a message before you start, his are probably the most riggerous. Thank you for the watch it is very much appreciated. Sure! That's fine. Just make sure you use the most recent version. What do you need the profile picture for? Sorry for not watching you earlier. Such a nice gallery!